Each week we have a special night we set aside for family time. My first grader was in charge of our family activity tonight and he decided he wanted us to make treats for a friend and take them Thanksgiving turkey cards. We ended up making two different EASY toddler turkey crafts using coffee filters and some simple supplies we had on hand. I'll be sharing the second turkey craft later today, so make sure to check back. During the holidays my only goal with crafting is SIMPLE. I don't do complicated things since I get thoroughly overwhelmed by all of the "to do" lists when hosting Thanksgiving. This project is a perfect one to set out for little guests at your Thanksgiving dinner. This craft is pretty self explanatory and is very similar to the process we followed when making our paper plate shape turkeys. To start off you decorate the coffee filter using your (affiliate link) Do-A-Dot markers. I love the round circular marks the dot markers make better than the lines that regular markers make for this project. Next since we were making cards we glued the coffee filter to a colorful card made out of construction paper. After that we glued on a turkey body cut out of a brown paper bag. Then we added on a red gobbler, an orange beak, and googly eyes. My daughter added some additional details with her markers- like eyebrows and legs. Once the turkey cards were dry we wrote special notes inside to our friends. The kids are excited to deliver the treats and cards to their friends tomorrow. Along with making treats and cards, we read A Turkey For Thanksgiving by Eve Bunting. 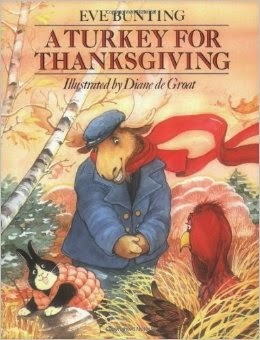 I had never read this book before and now I'm going to buy one to add it to our Thanksgiving book library. The story is darling. It is about animals that go hunting for a turkey so that they have one for dinner. The ending has a sweet little twist. We also love Twas the Night Before Thankgiving by Dav Pilkey since it is pretty funny. The children decide to try and save the turkeys from becoming Thanksgiving dinner. My kids got a kick out of the book even though some of the rhyme didn't work. 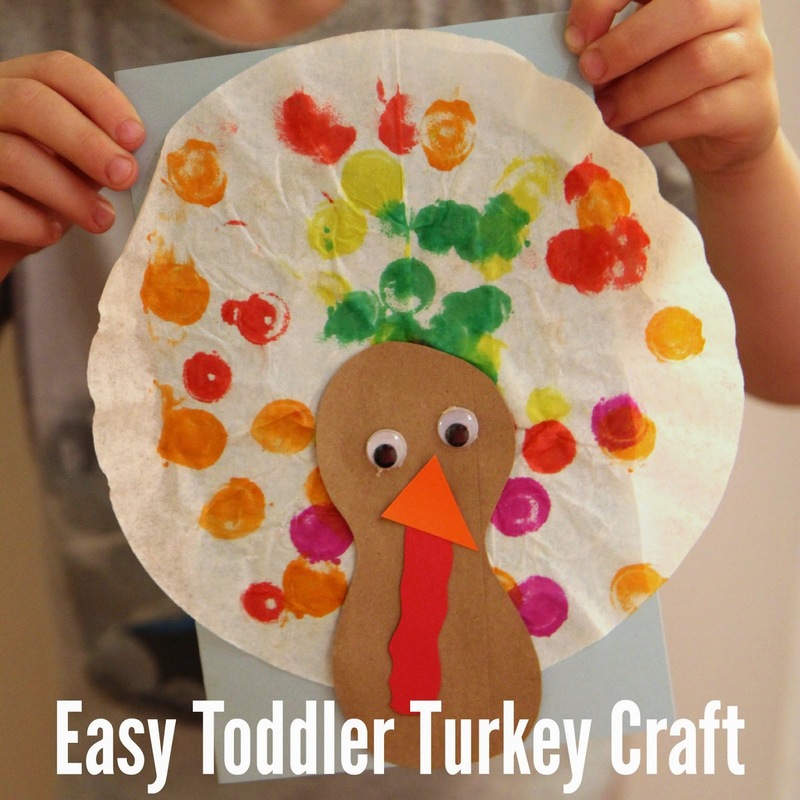 Do you have any other favorite EASY Thanksgiving crafts that you like to do with little ones? 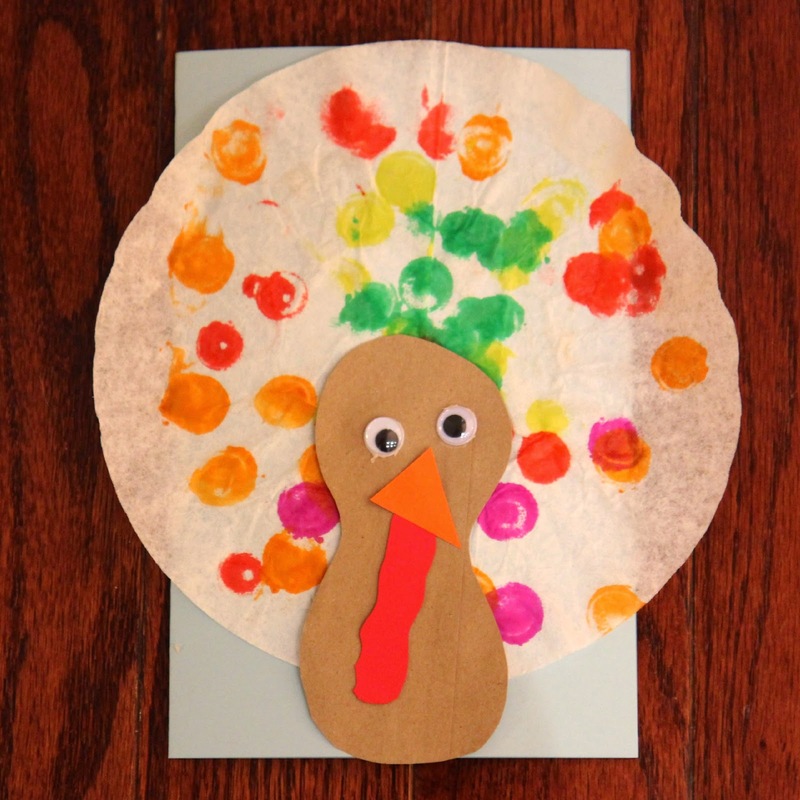 Plus don't forget to check out our Easy Spin Art Turkey craft!